The original Model 6 grinder from Jones incorporates form and function. Able to be used on both Head-saws and Edgers, the Model 6 will suit all of your needs. Available with 120 volt AC motor, 12/24 volt DC motor, and Air. The Model 6FX incorporates the flex shaft drive system for remote use. 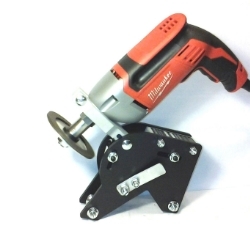 The Model 7 uses a new Milwaukee motor to improve on the lifespan of the Model 6 while retaining all the benefits of being able to be used on Head-saws and Edgers. The Model SX33D improves upon the innovation of the SX20 by reducing the size of the mount, incorporating a new style diamond drum to sharpen your carbide ITCO / Slashers faster and more accurately. 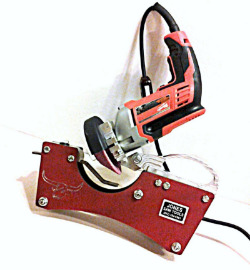 The Longhorn say sharpening system utilizes a larger mount to enable more control and stability than other grinders. Only to be used on Head-saws. The model CH4 is for use on carbide tipped blades, it come with one 4" diamond wheel. The Model 3 is a basic grinder, it comes with one 3-1/2" grit wheel. It is primarily recommended for use on Edger blades but it will work on Head-saws. It is not recommended for use on vertical edgers.